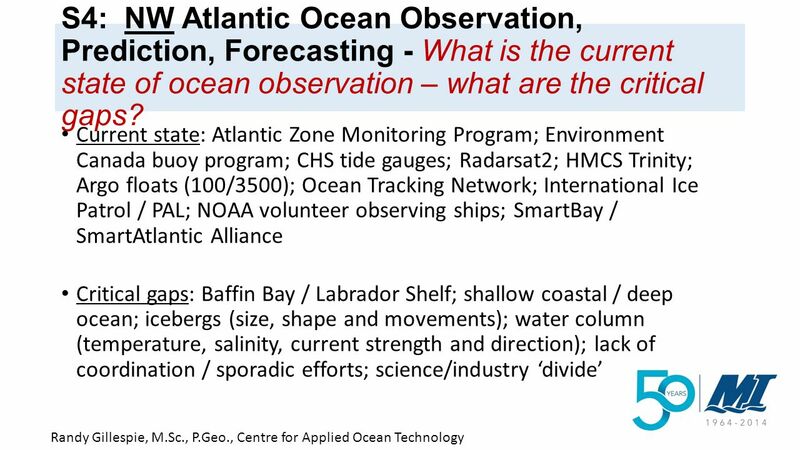 Download ppt "S4: NW Atlantic Ocean Observation, Prediction, Forecasting - What is the current state of ocean observation – what are the critical gaps? Current state:"
The Operational Marine Climate Monitoring and Forecasting System of Puertos del Estado (PE) Área de Conocimiento y Análisis del Medio Físico Puertos del. Ocean Vocabulary The energy is being passed through the water as a wave. 2.Wave: the movement of energy through a body of water. NOAA RESEARCH PERSPECTIVES: AUTONOMOUS TECHNOLOGIES FOR OCEAN OBSERVATIONS Chris Beaverson Acentia, LLC Supporting: Ocean Exploration and Research Program. THE ARCTIC: The World’s New Economic Frontier and Opportunity for Development, Shipping and Expansion by Ernst Frankel Professor of Mechanichal and Ocean. 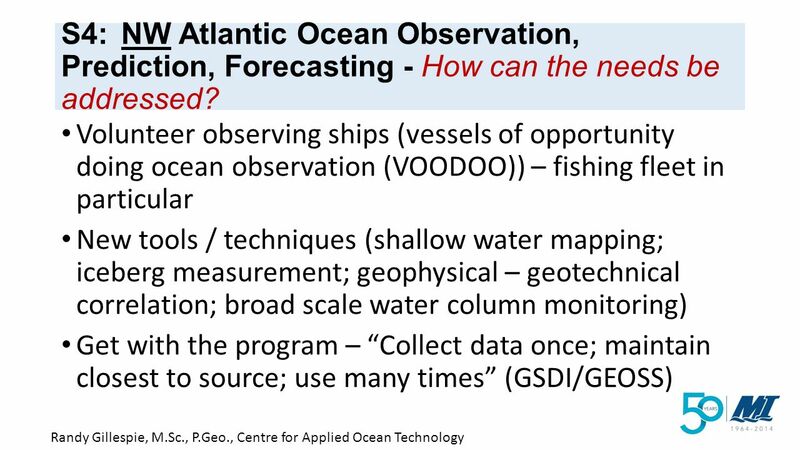 Galway-related Progress on Ocean Observation and Prediction Doug Wallace MEOPAR Pierre Pepin, DFO Marine Working Group Chairs for Ocean Observation and. 1 Zdenka Willis Director, National Oceanographic Data Center SEADATANET June 9, 2006. 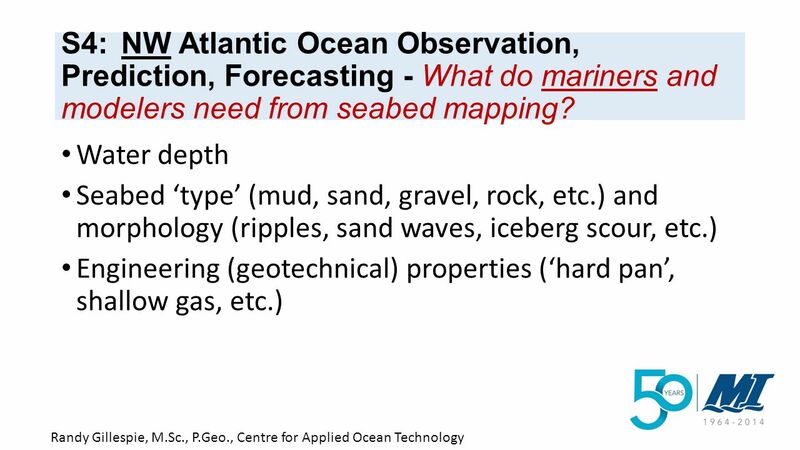 INTRODUCTION TO GENERAL OCEANOGRAPHY (GEOL 1033) “Few people stand at the edge of the sea without feeling awed by its size and power, and without wondering. Baltic Operational Oceanographic System (BOOS) Erik Buch Centre for Ocean and Ice. The Gulf of Maine Ocean Observing System. Technical Program Real time monitoring and forecasts of: Weather - surface ocean winds, air temperature, visibility. Ocean Observing in Newfoundland & Labrador - Some Practical Applications Maritime Collaboration Summit Nov 18, 2009 – San Diego. Monitoring and Modelling the Spanish Coastal Waters. A new concept: The Operational PdE PORTUS System Workshop on “The status of coastal observing and. MEDSLIK oil slick simulation Sea Surface Temperature Dashboard Forecast of sea currents in the Malta shelf area Forecast of wave height and direction for. THE ROLE OF OCEANS Quenton R. Dokken, Ph.D. Gulf of Mexico Foundation Small Sea Changes: BIG Infrastructure Impacts. What weather phenomena has the largest impact on our weather in Texas? Ocean Weather Station M - from weather forecast to climate monitoring Ingunn Skjelvan Bjerknes Centre for Climate Research and Geophysical Institute, University.